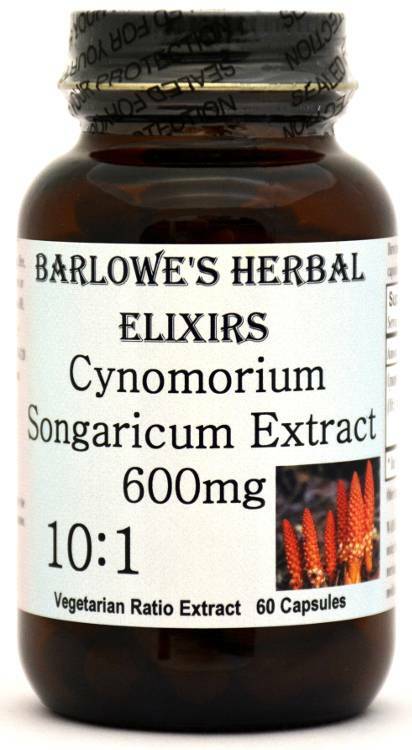 Barlowe's Herbal Elixirs offers a very hard-to-find 10:1 Cynomorium Songaricum Extract (Herba Cynomorii). In Traditional Chinese Medicine (TCM), Cynomorium is used primarily for impotence in men and lack of libido in women due to a deficiency of Kidney Yang energy. It is said to be beneficial for the joints - especially the knees. Bottled in Glass! No Stearates! No Fillers! No Junk! 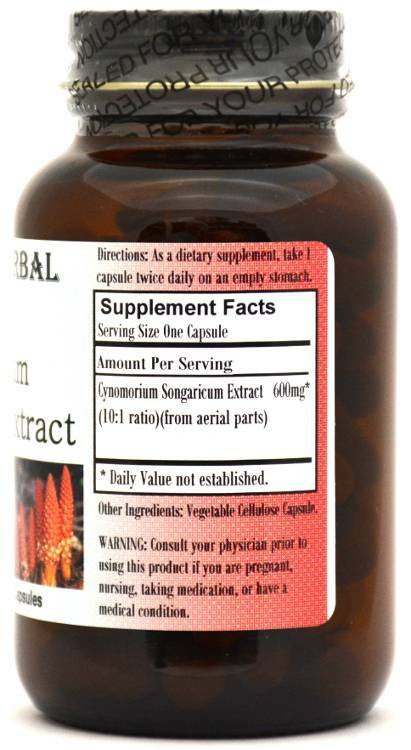 Barlowe's Herbal Elixirs proudly offers a hard-to-find 10:1 Cynomorium Songaricum Extract (Herba Cynomorii). In Traditional Chinese Medicine (TCM), Cynomorium is used primarily for lack of libido in men and women due to a deficiency of Kidney Yang energy. It is also said to be beneficial for the joints - especially the knees. 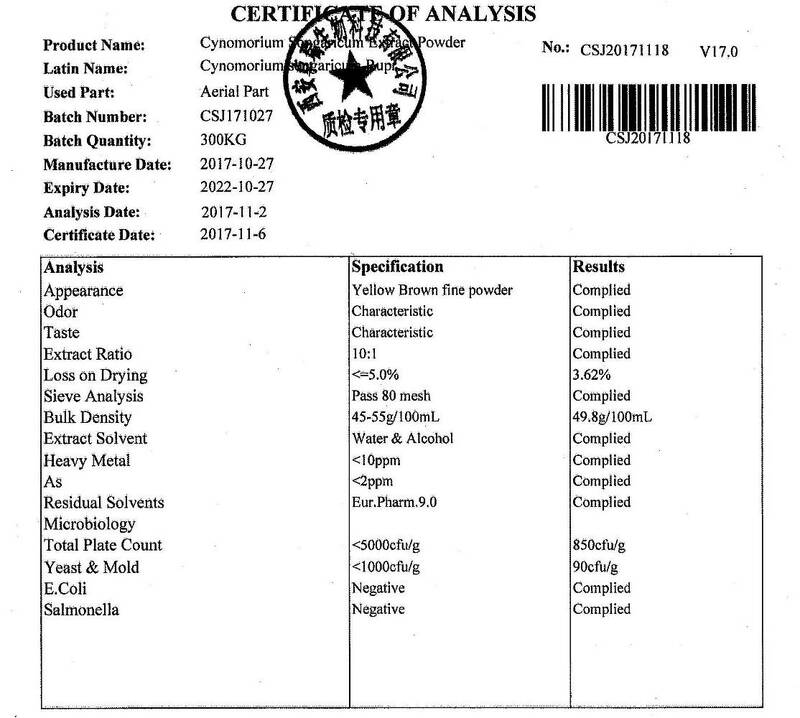 The Cynomorium Certificate of Analysis (COA) of this particular batch is shown above. Bottled in Glass! No Stearates! No Fillers! No Junk! Cynomorium Songaricum did not enter into the Chinese Materia Medica until 1347, when the Mongolians introduced several medicinal plants from their areas into China. One reknowned herbalist produced a famous remedy made with Cynomorium (Hidden Tiger Pills) which was utilized for male libido and weakness of the legs and knees. The name was based on a tiger in the crouched position, since remaining in a crouched position requires substantial strength in the tendons, ligaments, and muscles of the legs. Cynomorium is considered to be a superb tonic for building primal yang essence in both men and women and it is also considered to be a longevity herb. Larger doses can be used to relieve constipation. One should not use Cynomorium if there is a problem with diarrhea, as larger doses may loosen the stool. Caution: Studies have shown that Cynomorium is generally safe, but it is very potent and should be utilized with care. Larger doses of Cynomorium Songaricum Extract may loosen the stool (don't use when you have diarrhea) and may cause blurring of vision. This product is for dietary use. If unexpected side-effects occur, discontinue use immediately! The above statements have not been evaluated by the Food and Drug Administration (FDA). This product is not intended to diagnose, treat, cure, or prevent any disease. Directions For Use: Take one or two capsules daily on empty stomach. For some people, dosage may need to be increased as results and usage amounts vary based on body type and weight.